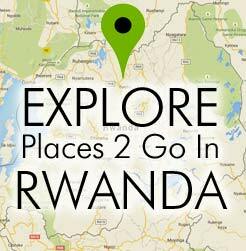 Description: Yes, Rwanda is landlocked, however the country’s western border runs along the entire length of beautiful Lake Kivu. 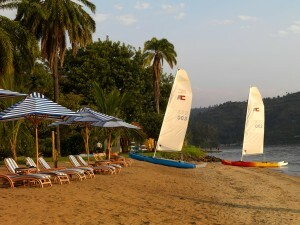 This makes nearby Rubavu (formerly Gisenyi) the perfect place for a tropical beach vacation. Fringed with lush tropical vegetation, the lower town of Rubavu offers sandy beaches, ample swimming opportunities, and palm-lined walkways. There are picturesque sunsets to be viewed and abundant birdwatching opportunities along the lake shore. The livelier upper town is comprised of a grid of busy roads around a central market. From this area of Rubavu, the active Nyiragongo Volcano’s outline dominates the northern skyline (on a clear day). Whatever your fancy is, be it relaxing by the lush shores of Lake Kivu, or immersing yourself in the lively central marketplace, Rubavu is a great town to relax in for a few days, perhaps reliving the memories created while gorilla tracking. Location: 60km west (1 hour drive) from the gorilla tracking base of Musanze, three hour drive from Kigali. Things 2 Do: Relax by the beach; experience the central market.